War comics had long been a staple of comic books. From Harvey Kurtzman’s Frontline Combat on to Robert Kanigher’s numerous war titles at DC Comics, comics about men in battle provided an enduring source of story material. World War Two was still in the rearview mirror and versions of heroic soldiers still inspired the nation’s youth. So it wasn’t surprising that one afternoon after school as Brady was wrapping up his weekly obligatory and finely choreographed browbeating of Mitch Knox’s most recent Charley and Chuck script, he said that, against his better judgement, he was going to give Mitch a shot at creating something new. While Batom Comic’s Starbuck Jones and The Amazing Mister Sponge clearly staked out their claim in the super hero genre, and Charlie and Chuck were holding down the fort in the kid detective market, Batom was noticeably absent on the comics spinner rack where war comics were concerned. Brady suggested that Mitch might want to give some thought to creating a war comic for Batom and Mitch asserted that he was game. The obvious irony of a fifteen year old boy writing a war comic was no doubt not lost on the pair, but Brady figured that this stuff was all made-up anyway and Mitch, despite Brady’s constant harping, was as good as anyone at making stuff up. So on their way home to Grafton, Mitch had his mom stop off at the Grafton library so he could rifle the library’s somewhat limited offerings of WW II history and visual reference books. Later that evening after the dinner dishes were cleared, he set himself up at the kitchen table and began work on the hero he was already calling Tank Thompson, who would be a WWII tank commander, but with a twist. 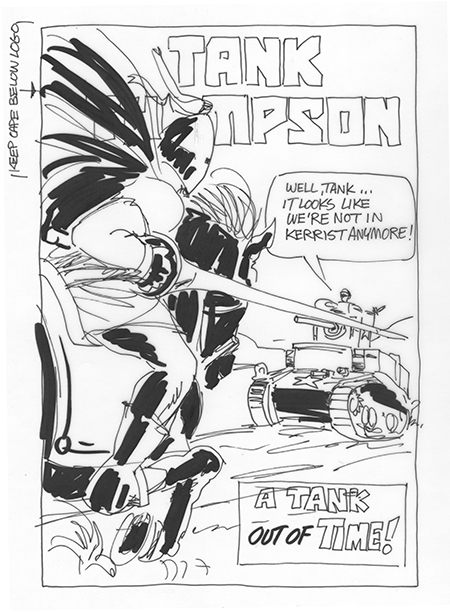 As Mitch began sketching a cover, he showed a medieval knight charging Tank Thompson’s tank with Tank exclaiming in an homage to Dorathy’s line from Mitch’s favorite movie The Wizard of Oz: “Well, Tank… it looks like we’re not in (quickly referring to his World Almanac for a French town that came the closest to sounding like Kansas) Kerrist anymore!” Mitch hadn’t been in WWII, but he had had to deal with Kenny Roadabarger on the playground after school, so, in some ways, the idea of facing fear inducing combat in the hedge rows of Franch wasn’t all that far removed from the dystopian hell of the Junior High School. And besides, this stuff was all made-up anyway.